Pros: Its a great reminder of all the things you have to do. Cons: Importing old program to new program will require work on cleaning up old data. Overall: The value for your money is a selling point because it was more cost effective then other programs. As for customer support I have never heard of a time that we have not been able to get ahold of anyone. The ease of use of this program has a learning curve but once you work with it you will understand how the program works. This program has several features, we use it in Engineering and Maintenance for our preventive maintenance program. It is an excellent reminder on all the things we have to keep in shape around the casino and hotels and the new event center. We also have lots of inventory. We maintain a inventory file. We can search and update parts. We can issue and receive parts. We can print adhesive labels with barcodes for our bins. We have added pictures of our parts. We have inventory reports. We do so many PM so we are able to maintain equipment. We can search and update it. We have created several reports that we use all the time. Right now we are on the cutting edge of rolling out a work order system to the whole casino. It has lots of features, some we use and some we don't. I know that we have our MaintiMizer program running very well. It's a work in progress and you need people to work to keep it that way. And I guess you will have to stay tuned on what else it will brings. We are happy with what we have built in it. Recommendations to other buyers: If purchasing make sure you ask about custom fields and other expenses. Make sure to ask a lot of questions to make sure this is the right kind of program for your company. Roxy thank you so very much for your review of MaintiMizer! We have heard from others that MaintiMizer can be more cost effective then some of our competition and we are thrilled that after that investment you can see a return so quickly! We value our partnership with Mystic Lake and look forward to continuing to grow with your business! Cons: Report Query are a little hard to understand. I wish project tracking had more functionality. Overall: Our company has been using the Web Edition of Maintimizer for several years. Our experience has been very positive. So positive we rolled out the system to all of our PA and NY operations. The system has improved our operations up-time by 10% on average. The asset tracking has helped us make smarter decisions on replacing equipment. Our maintenance mangers use the system every day for tracking work orders, purchase orders and preventive maintenance. Hands down purchasing Maintimizer has been one of the best decisions we have made in software over the last 10 years. The ASHCOM support staff are great to work with. We have not needed much support but when we did the team at ASHCOM worked though the challenge and helped resolve the issue. Why did I choose Maintimizer over the other systems available? Because I liked the format of the system and the dash board was simple and user friendly. Any PC skill level can understand and use the system. If you are a company looking for a simple and accurate computerized maintenance management system, then Maintimizer is a smart investment. Recommendations to other buyers: Need to make sure you have defined you system logic before you start entering data. Have a plan for your naming conventions and data flow. Make data sets that are applicable required fields. Ben thank you for your review of MaintiMizer! We appreciate the feedback on our Support Dept and you explaining exactly why you chose MaintiMizer! We will take your advice on enhancements as well! Thanks again! John thank you so much for your review of MaintiMizer! We have enjoyed working with you very much over the years! We are very glad you came back to MaintiMizer! We understand some companies make decisions for our clients and they are forced to use something else but we are very glad you were able to come back as this happens more often then you would think! We are always welcoming to our clients when they return! We are also looking into improving our licensing for our Mobile product and really appreciate your feedback! Entering WO's into system, and giving out Pm 's to Techs on a daily basis. Pros: Pros: easy to use once you put in the right info (easier to search for) parent, and division with in each building. Cons: PM dates are wrong when in search/update, you must go though the WO's to seek. and it does not talk to any other software like Outlook to auto input into system. Cons: PM dates or craft, does not show right date or who (craft) is doing WO at a glance, on search / update screen. (we use the Craft as each tech) Also auto E-mail function does not work to show when each WO is in process and or complete it said dept needs to know. We're happy to see that you agree MaintiMizer is a breeze to use! We're continuously trying to add new features and integrations to MaintiMizer so stay tuned for that! As far as your PM dates being wrong, that may be an issue with how you've entered your information. Our support team would be more than happy to help! I've sent you a message so we can get started on finding you a solution. Happy MaintiMizing Todd! It's been great working with you and Tosoh Quartz over the years! Pros: It is very effective in regard to summarize the costs of assets to carry out a record for each unit. It also measures the effectiveness of each individual employee. With regard to the inventory, I like very much because it is carried out in actual inventory. Personally, I work in the following way. The employee has your mailbox where you leave the work order assigned to the employee recognizes the work to run it. When the job is drafted by the parties on the same sheet and closes in the program leaving in record expenses for work and the deduction of parts. Cons: On rare occasions the server slow.If you are going to print a work order should mark that order has already been printed for your compliance as soon as lead and not print record repeated. Thanks for the detailed review Jose! We¿re glad to hear that you¿re able to effectively measure organizational value with MaintiMizer. Our dedicated team is available for custom programming if you¿re interested in pursuing business specific requests. Cons: BEFORE YOU BUY THE PROGRAM ASK ALOT OF QUESTIONS TO MAKE SURE THE PROGRAM FITS YOUR COMPANIES VALUE. ALSO ASK WHAT THE PROGRAM CAN DO AND NOT DO. Thanks for the great review Dale! Sounds like you're utilizing MaintiMizer to it's full capacity. We look forward to continuing our work together and helping Mystic Lake Casino reach peak performance! Quick to respond to issues, feature-rich solution. Pros: Multitude of options and features. Support is quick to respond to tickets. Web based portal allows flexibility when logging in from different devices on or off site. Cons: Mobile platform is not user friendly, MS tablet PCs underwhelming performers. Didn't live up to the hype, ended up moving away from mobile licensing and adopted using the web portal on iPads instead. If an atypical issue was encountered support would sometimes respond along the lines of, "well, it works for everyone else..." Wish the GUI was more modern. Overall: Able to monitor and report on maintenance issues easily. Jake, thanks for taking the time to write a review for MaintiMizer. Glad to see that, overall, you've had a positive experience with our CMMS. The mobile version of MaintiMizer and the GUI of MaintiMizer is something we're continuously improving and tweaking. We'd love to hear more about any atypical issues you may be having. Thanks again, we're looking forward to continuing our relationship with Pine Rest Christian! Simple system, customer service is good. Does what most people look for in a system. Pros: In my career, I've used everything from big budget CMMS software to homemade Access-based systems. This software does what most people require from a CMMS system at a reasonable price. Service and communication from Ashcom are excellent. Cons: Some features of the software are a little difficult to use or require a few extra steps to complete, such as work order assignment. Some things that you only use on occasion are hard to find. Hi Michael, thanks for taking the time to review MaintiMizer! We're glad to hear that our CMMS compares well to other big named software, at a competitive price to boot! To address your concerns about being able to find features, we do realize that due to our system's many capabilities that sometimes it can be difficult to keep track of everything MaintiMizer can do. Luckily, our support team is available and happy to help you through any issue, even if it's just finding a better way to navigate a menu. Thanks for using MaintiMizer Michael! Decent software, but not as customizable as we need. Pros: Inventory can be maintained and adjusted either by the technician or the administrator. The PM schedule can be set up and maintained fairly easily. Cons: Once information has been put in, you can't delete it even though it no longer applies. The parts list continues to grow even if one part number is replaced by another. Overall: Generally it is a way for maintenance related requests to be submitted and completed by users in the organization. It also generates PM schedules and tracks their completion rates which we use to audit our efficiency internally and to our customers. Thanks for taking the time to review MaintiMIzer! We're glad that you are successfully utilizing our CMMS. We are a little wounded that you didn't find it as customizable as you wanted, we do offer custom programming so we can effectively make MaintiMizer as malleable and versatile as need! I've messaged you my contact info in case custom programming is something you'd be interested in. MaintiMizer is a great CMMS. Pros: It has all the features we require and is very easy to use. It's very easy to track how much time/money is spent on an asset to complete cost benefit analysis and figure out what we should fix and what we should replace. All of our staff (technical and non-technical) can easily use the software. Their technical staff is very nice to work with. They know us by name. Cons: MaintiMizer has grown over the years. We've had issues with it, but their staff have helped us very quickly. The current version has no issues for us. Overall: Cost tracking. Job tickets. Job logs. Maintenance procedures. Great system. We're very excited to see that you are loving MaintiMizer! basically I'm only using the system for parts information. Pros: easy to find parts location, usually you put in a part number and it gives me a parts location. i also like the PM scheduling side and the ability for it let us know what reports are due and when..
Cons: when using an old outdated part number it would be nice if the old part number that was moved to the description side when the new part number added could be found in the text by only inputting in the the new part number in the part number spot. i know it can looked in the description section, but is a lot of extra key strokes. Overall: freedom from a card index. Thanks for the review Nelson! We're excited to hear that MaintiMizer is working well for what you need it to do! Our support staff is well-versed in finding shortcuts through the software. We'd love to try and help you find a more efficient solution to your process. Thanks again Nelson, happy MaintiMizing! Pros: Easy search and save options. Customer support and all the Maintimizer staff are nice and easy to communicate with. Cons: You do not make it easy to correct an item or remove an item if a mistake was made entering. That is one thing that I would like to see changed in the future. Overall: It keeps track of all my inventory and the tool rooms inventory. I have just started to get into the P.M.'s and really having trouble understanding what is in the manual. The manual is not written for a person that has never used the system before. It could be more user friendly. LaVerne, thanks for taking the time to give us a review. We're glad that, overall, you're having success with MaintiMizer. Regarding your concerns about removing an item from MaintiMizer, it's intentionally difficult to do because we want to avoid any accidental deletion of integral company records. A lot of MaintiMizer systems are accessed by many employees with many different roles, this helps to avoid any critical errors. Thanks again for the review LaVerne! Please feel free to reach out if you'd like to learn more about how to fully utilize MaintiMizer. Pros: Ability to maintain a history, run reports, create inventory parts lists and locations, create a good Preventive Maintenance program. Cons: When entering a new part number, it does not prompt you that a part number already exists until after you input all the information, when entering dates they have to be specific example: 10/25/2017, it does not auto correct if you were to put 10/25/17. Overall: We have been able to maintain a great Work Order and Preventive Maintenance program to meet the needs of our company. Kimberly, thanks so much for taking the time to write MaintiMizer a review! We're glad to see that your organization was able to implement a successful Preventative Maintenance program with MaintiMizer. We look forward to continuing our work with McNaughton & Gunn. It's always a pleasure! Thanks again and Happy MaintiMizing. Pros: It is easy to understand. Fairly simple to add data. Navigating within the system is simple. The clarity of roles and role rights is helpful. As long as the system is set up correctly initially it is a great tool. Cons: It can be a little tedious to make changes. If the initial setup was not done properly it can be difficult to navigate some of the information previously entered. On the plus side Ashcom will assist with making changes. We appreciate you taking time to give MaintiMizer a review! We're glad to hear that you are finding MaintiMizer easy to use and our support staff helpful! One of our points of emphasis as a company is to make sure that our user experience is as pleasant as possible, which is why we focus on those two areas so intently. Thanks again and happy MaintiMizing! Cons: I think that the customer support could be a lot better and online training via webinar would make training easier and more affordable. Overall: It's ran our preventive maintenance and work orders for the past 26 years and I've enjoyed using it and being the administrator of the program. Thanks for the review Shelley! We're sad to hear that your company has decided to move in a different direction, but we've truly enjoyed working with you over the years. It sounds like it's out of your hands but if there's anything we can do to improve your experience with MaintiMizer we'd be happy to help! Thanks for MaintiMizing and good luck going forward! good tracking and reminder system. Pros: The scheduled PM work order generation. Cons: difficult to grouping the passed PM and work order, it will be great is all the data can be form out a report and list or graph so we able to do analysis discussion easily. Overall: for this whole 2 years experience with maintimizer software, i find it is value for money versus before, we having a lot of spare part tracking issue example where does the part went to and untraceable machine history to help us defining machine capability. Now we are just following the PM being set earlier and resolving high occurrence machine issue, i seem our machine monthly breakdown record had drop to half comparing to passed. John thank you so much for your review! We are very pleased to hear your machine monthly breakdown has decreased by 50% thanks to MaintiMizer! We will be contacting you about the report you are looking for! Pros: I love how many different types of things you can do in the software other than just Inventory Management. Cons: Query Builders.They are helpful and awesome but difficult to use if unfamiliar. It is pretty amazing that you can make any report you desire. Overall: We have been using MaintiMizer for over 5 years. We absolutely love the software and customer support. The software has amazing features that really make doing my job easy. We love that we can do more than just Inventory Maintaining in the software. We use PM Plan, Equipment Tracking, Input Work Orders, Purchase Orders / Requisitions, Key Inventory, Invoicing and more. Recommendations to other buyers: Explore all uses of the software. Carol Anne thank you for your review of MaintiMizer! We are glad MaintiMizer can help make your job easier for you! We truly appreciate your continued support of MaintiMizer and Ashcom! Use this program every day at work, frustrating every day. Pros: Spell check. With the old version only two fields could be used when searching for parts this version allows many fields. Cons: Where do I start. Not being able to delete or change part numbers is huge, I can see keeping the old numbers for accounting but the stockroom part of the program should allow these functions. When we get rid of a piece of equipment and zero out the inventory and set it to inactive these parts still come up if a zero stock report is ran. Sometimes the parts search does not work. The print part of the program is set for European paper not American so printing is a pain, could have been set for 8X11 which would work for both sizes. Cannot set the number of days to print for receivers, the default is set for the past week but we print for 1 day so we have to change the date each time we print. When the program was set up the date range was set and I was told this could be changed later, when I asked to have it done I was told it would involve a change in the software and we would be charged for this, give me a break. The receivers are for some odd size paper and are laid out in a way that wastes a lot of paper. each time we print one we have to take extra steps so it will print in a usable/readable manner. Purchase orders are also laid out poorly and waste paper, why print one page when you can print three, right. Does Ashcom own stock in a paper company? Have given up on getting any help when we have problems, we just find work arounds. Have not had issues like this with other software I use, so I don't think its me. Overall: If you mean Maintimizer then no real benefits, would have rather stayed with the old version. We're sorry to hear that you were not satisfied with your MaintiMizer experience. We've reached out to you and will try everything in our power to remedy this situation. Our support team was recently was on-site at Sheridan Books and the employees attending the training had nothing but positive things to say about MaintiMizer. We know it's impossible to please everyone but we'll still keep trying. Cons: cant delete equipment no longer in use with out deleting all old records tied to it. Overall: I am a maintenance coordinator for my company. I use Maintimizer every day to write Work Orders and Preventative Maintenance WOs. It is very easy to use and has many other tools that our company is able to use in other departments. I enjoyed the training Ashcom has provided. Overall I am satisfied with this great tool. Recommendations to other buyers: for training classes that fly to Michigan, dont take them bowling after they had shoulder surgery, i recommend you take them to a pro or college game at one of your amazing fields instead. just saying. Brandon thank you for your review of MaintiMizer! Of course the delete feature is there for data integrity but we are looking at added functionality in that area! Thanks again! P.S. We owe you a Tigers game! Very solid and easy to use software. Pros: Very user friendly. Most of our user's have limited computer skills yet Maintimizer is designed to accommodate everyone. The software is mature and well thought out. Cons: I honestly can't think of a single shortfall in the software. That said we don not use PO's, Inventory, or the timecard function. Overall: Allows us to easily capture our annual cost of maintaining 2.6 millions square feet of buildings. John, we appreciate you taking the time time to give MaintiMizer a review! We're thrilled to hear that you couldn't find a single shortfall in our software. Our app developers are now requesting vacations. We look forward to continuing our work together John! Pros: Ease of use for the end user. Intuitive software. Overall: I am the IT engineer that supports Maintimizer at this facility. I work closely with my maintenance department for upgrades and any issues they may have and I have found that the program is intuitive and easy for the end user. Support is outstanding as we have to wait in a queue to get assistance and we almost always have the same person help us and who is familiar with our setup. We are now diving into features that we have never used before, like barcode scanning and mobile devices. Over all This is a great software! Jeremy thank you for your review of MaintiMizer! We will definitely take your advice on the RFID tagging support! Wesley, thank you! We appreciate you taking the time to give MaintiMizer a review. We're glad that you find MaintiMizer affordable and we agree, our support team is pretty awesome. With that said, if you find certain areas more difficult to use our support team should be able to give you a walk through. If you would like even more clarity on certain modules we do offer in-depth training. Thanks again Wesley, we look forward to working with you and the rest of Bodega Bay Public Facilities. Pros: There are so many possibilities with this system. It's nice you can put your equipment in and set up a schedule to automatically generate PM paperwork. I like that you can save SOPs to use for similar equipment. Cons: It's internet-driven, so it depends on your internet service. You must have a separate equipment code for PM on the same equipment for monthly vs weekly, etc. It requires a lot of steps to generate work orders/PMs to print. There are a lot of steps to get to next PM/work order to do updates. You can't delete former employees from system. When you need help, you always have to pay for it, rather than it coming as part of the package. 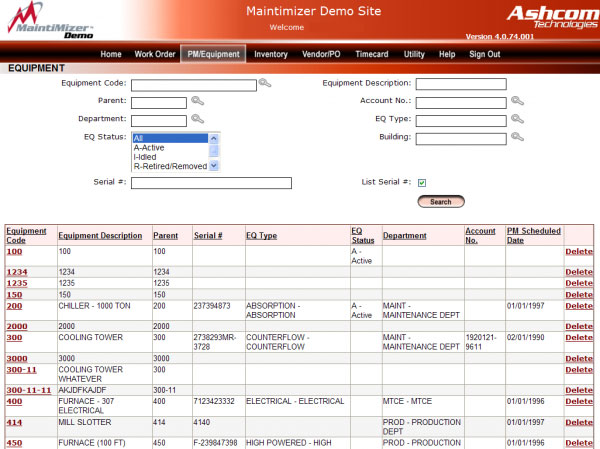 Recommendations to other buyers: This software can be used for PMs on equipment and inventory. You can add employees and warranties, just to mention a few things. Thank you for your thoughts on using MaintiMizer. I think there is a little misunderstanding about our technical support assistance that I would like to clear up. Unlimited technical support for MaintiMizer is available to clients with a current Annual Maintenance Agreement (which you currently have). As long as your technical support requests are not training related, our knowledgeable support engineers are here, ready to help you at no additional charge. In addition to technical support, the Annual Maintenance Agreement also cover system updates and patches, ensuring you are using the most current version of MaintiMizer. Please contact us if you have further questions or you need help with your system, we look forward to assisting you! Thank you. Pros: I like the Customer Service I receive when I need help. There is no hesitation on waiting time and I am not tech savvy but they understand what I what I need. Overall: There are still some areas that could be made more user friendly. Like printing reports, Hierarchy viewing abilities could be better, especially for those who don't use it all the time. Thank you for your review of MaintiMizer Roberta! We appreciate your feedback and will use that for future enhancements to the system! Pros: Packed full of great features. Particularly love the PM's and the auto generate feature. Overall: Great product and has been a fantastic tool for our Facilities department. My only complaint would be the query searches. Trying to figure out exactly how to use certain words, categories, and <> = - to pull information can take hours. Shane thank you for your review of MaintiMizer! You will be glad to know we are always improving upon our Query builder and will also take into consideration the use of special characters! Pros: has many options like keeping time, cost center, parts lists, parts orders, communicating, preventative maintenance. Pros: The ease of use that this software offers is way better than many i have used in the past. I was able to get all information entered quickly. Overall: I got much more effective spare parts tracking. I was also able to track work orders and generate work orders weekly for the maintenance associates. We have gone more green using this by eliminating a lot of waste paper. Zack we are glad you are enjoying MaintiMizer! We are also happy to show you more on scanning as well! We are here to make managing your Maintenance Dept as easy as possible! Pros: Maintimizer is easy to use and all menu options are laid out in a good format. Inventory function is also user friendly. Cons: PM system needs added functions. Would like to have it where when a PM is closed and you have 2 overdue PM's for the same item it should prompt you to close the older PM's out. Hi William, thanks for the review! We put a lot of our resources into maintaining MaintiMizer's ease to use, so thank you! We also appreciate your suggestions, we're continuously improving MaintiMizer and this is a helpful recommendation. We look forward to working with you and the rest of Fehrer! Cons: Customization is pricey but most of the things I need I can figure out a way. I wish I could query on "Assigned Employees" not just actual though. We¿re glad to hear you¿re having success with MaintiMizer. If you¿re having any issues at all, our support team would love to work with you to find a solution! For the most part the software does what it is intended to do. Pros: Easy to use for guest users. Quick comprehension of website by department staff . Cons: I have issues with the reporting process, very cumbersome and I am not able to get the required information as needed. Also sometimes the website will stall. Jill, we appreciate you taking the time to review MaintiMizer! It's awesome to see that, overall, you are pleased with your experience. As far as the reporting process and website, we'd love to hear what exactly your issues were. I sent you an email so we can open a dialogue about getting your issues resolved! Hi Jeremy, thanks for taking the time to write us a review! Overall: We love MaintiMizer here at our facility. It is easy to navigate, and the customer service support is outstanding! Brittany thank you so much for your review of Maintimizer! We are so glad that you are using the benefits of MaintiMizer at your location! We strive to provide exceptional Customer Service and will applaud our team for the care they have provided to you! Pros: The software is very easy to manipulate and very adaptable. We use the hosted version and have seen no downtime with the system. It is user-friendly, which makes it easy for your users to train, including operators and mechanics. Aschcom is very supportive, and if you have questions, they usually can get you immediate help. Cons: When generating PMs, there is not an automatic function that creates a due date for PMs. For instance, if I generate PMs for a two-week period and I have weekly PMs for the same piece of equipment, it will give them both the same due date. So you have to go through each PM and change the PM due date. Also, it is very difficult to perform mass changes without going through each record. Recommendations to other buyers: Before you choose the software, determine what support you will get. Training is usually one week and goes over a lot. I also recommend you have a plan on how you are going to get all your inventory into the system, which has been the most arduous task for us because we had no tracking system previously. Thanks Lester, this is a very well written review! We appreciate you taking the time to give us some feedback! Regarding your suggestion that you would like a better way to perform mass changes we do have a feature on MaintiMizer to apply global changes. Our support team is always happy to help, 800 366 0793. Pros: The ability to look up parts is relatively easy. Most users are able to navigate the database with a minimum of training. The more they use it, the easier it is to find what you are looking for. Cons: You cannot always delete things once records are created. For example, if you make a mistake when receiving something, you cannot simply delete the record and start over. Doreen, thanks for the review! it's awesome to hear that MaintiMizer is a good fit for your business! In order to avoid accidental deletions of integral company records MaintiMizer gets a little cranky when removing information. With that said, our support team is more than happy to help you through any issues you may be having with removing information from MaintiMizer. A lot of data entry to get started, but well worth it. Pros: The software is very detail oriented. It tracks employees, parts, and equipment. Very helpful support staff. Cons: You're not able to attach pictures to SOP's. You can attach them to printout with, but not on, the SOP. Overall: Data recording of maintenance and repairs. Tracking of repair parts used and where used. Easy re-ordering of used parts. Thanks for the review! We take a lot of pride in the accessibility and friendliness of our support team! They also make a fantastic pot of coffee! We appreciate you voicing your concerns. We're constantly updating and evolving MaintiMizer to be the best possible CMMS on the market. We look forward to growing alongside your business! This is very user friendly once you figure it out. Pros: MaintiMizer software is user friendly after you get the hang of things. It takes a bit to get use to like anything else. Overall: MaintiMizer program makes it easy to put in parts on things that are worked on. Love the pm area too. Reminds our mechanic last time things are done and when they need to be done again. Tara we are glad you like the PM area & are also utilizing parts! We have a mobile product as well that helps when your Techs are out on the floor! We are happy to show you ways in which you can go paperless! Is a great tool to manage your inventory once you get your training it will be more easy use. Pros: The inventory management part. Also the facility to create a work request in the basic mode. Is a really easy tool to use once you understand it. Cons: It don't have a mobile app. In a World that the phone is very very use it. The tool need a mobile APP. Overall: Real time knowledge about where is my inventory and the exact amount. Also the tool send automated PM for the equipment's. Jose, we appreciate you taking the time to give MaintiMizer a review! We're glad to hear that our training helped you fully utilize MaintiMizer's capabilities. We currently don't support a native app for iOS or Android, but we do support Windows Phone and other mobile devices can access MaintiMizer via web browsers. Pros: Easy to navigate through screens, user friendly for the most part. Can easily find what I need without too much effort. Cons: Depending on what I am doing, its sometimes hard to find the clock #'s I need to enter the hours for employees, I don't have their clock # only their name so I have to scroll through ALL employees to find the correct one. Thanks Amy! We appreciate your review! We appreciate you voicing your concerns with MaintiMizer. Our support team is available to help you resolve any issues, efficiency related or otherwise, that you may be having. Maintimizer is an excellent CMMS tool with good functionality. Pros: The system is easy to use and administrate. Excellent customer support from the team. The functionality of the program enables the administrator to make some screen changes without further costs. Cons: Some minor issues at the start but resolved on the run. This was mostly due to the program upload which was corrected. David thanks for taking time out of your busy schedule to submit a review of MaintiMizer! We appreciate you! Overall: We have struggled to maintain a paper system for years. Once we received Maintimizer we went to work entering all of the necessary information which was very easy to do. I am now able to automatically generate all of the PM processes for the machinery. The SOP info is in with all of the PM's as well which make the job so much easier. Zackery thank you so much for your review of MaintiMizer! We are glad the SOP functionality is working so well for you! Pros: Customer service is fantastic! After meeting our trainer, I have been able to contact him with basic questions and he gets back to me as soon as possible. He also lets me know if it will be a little while until he can get back to me. Cons: Some features I would like are not available such as selecting multiple items in more areas, more detailed closing options, etc. Recommendations to other buyers: Implementation is key! Regardless of validation or other departments, make sure you fully integrate data! This is an amazing program but you have to give it all of the information you can to fully utilize it's potential. Even if you don't think you will use some of it's features, bring in the data. I guarantee you will put it to use someday, and it will be that much easier if you built the database from the ground up. Aw shucks, thanks Amanda! We love your recommendation ¿ inputting as much data as possible into MaintiMizer can make a huge difference! We¿ve made quite a few updates since this review and we do offer custom programming. We¿d love to talk with you about what we can do to make sure your organization is getting the most out of MaintiMizer! Pros: Good set up for use. Able to keep track of a lot of stuff. Has many tools to use and can be a great ordinary use. Cons: Some of the drop downs could be more user friendly. It looks a bit over whelming to a new user so that could be smoother. Thanks for taking the time out of your day to give MaintiMizer a review! We're glad that you're finding success with MaintiMizer! We know MaintiMizer can seem overwhelming but that's only because of the many features and capabilities we've packed in! If you ever need help navigating or wonder, "Hmm, what does this button do?" Feel free to contact support and we'll be more than happy to help. I've been a user of Maintimizer for over 20 years. I've found it easy to use and very affordable. Pros: Very usable for our needs at an affordable price. I like that we can use just the PM portion without having to populate the rest of the system. Cons: Has many features that we don't use. Would be nice if we could just pay for the portions we use. We use only the PM portion. Overall: Improver reliability of equipment. Jim, thanks for taking the time out of your day to give MaintiMizer a review! We love to hear from our long-time MaintiMizer users, especially when they still enjoy using the software after 20 years. Here's to 20 more Jim! Functional and gets the job done. Pros: The thing I like most about this software is that we are able to label all our equipment by area. It's very helpful when printing out the PM work orders for the week. Cons: The biggest flaw I find in this software is that at time the menus can be very difficult to navigate. Overall: Able to keep up on all our maintenance on equipment. We appreciate you taking the time to give us a review Correy! We'd love to help you better navigate our system! We offer on premise training and our support staff is happy to answer any questions you may have. Use this every day and it seems things get changed at times making task more difficult. Pros: There is a lot of information that can be entered to aid with finding what you need later. I like the way the home page is set up. Cons: It can be difficult to find some of the fields when you need to add something. There are issues with picking dates from the calendar. Overall: It is easy to set up PMs and generate. It would be helpful in setting up inventory also. Management likes the report on the front page. Hey William, thanks for giving MaintiMizer a review! We're glad to see that you like our interface! We think it's very handsome! MaintiMizer is always evolving, because we're continuously adding features and improvements. If you ever need help navigating our new features please feel free to give our support team a call. They're happy to help! Thanks again William, we look forward to working with you and Mayville Engineering now and in the future! Comments: Maintimizer seems like it could be a highly effective software tool for scheduling routine maintenance and also for predicting future break downs on machines. If the software is used correctly it can make the job of the maintenance technician a lot easier. The one feature that I am not sure it has as our company does not use it is if parts can be added to a work order. This would allow for parts tracking, but would only work if the parts are set up in a computer system which we do not have. Pros: I like that the pm's are generated automatically. Recommendations to other buyers: Look into how you will utilize this product to determine if it's the right fit for you. Thanks for the review Dan! At Ashcom Technologies we like to think MaintiMizer is a highly effective tool for scheduling routine maintenance and preventative maintenance, in fact, that¿s what we built it for! Parts can be added to a work order, our support team would love to walk you through the process! 800-366-0793. Customer support is great and has a very quick response. Pros: The system accurately logs our data that we need. As long as we know the right query we can access that data. Cons: If the data isn't enter just right or, the query isn't set up just right good luck getting the data you are seeking. Entering data is very time consuming. Overall: Logs data relevant to machinery. Hi Taylor! Thanks for taking the time to write MaintiMizer a review! It looks like that you're satisfied with MaintiMizer, but not a bona fide MaintiMizer lover like most of our other users. If there's anything specific we can do to improve your experience, or any support we can offer, I'd be glad to help! I sent you my contact info. Thanks again for using MaintiMizer and giving us a review! We're setting up the system for our Company. Amazed at how much information the system can hold. Pros: This software is going to be great for tracking and assigning PMs and work orders. Tracking repairs on equipment to note repetitious repairs. Adding in total repair costs of equipment to justify replacements or major overhauls of equipment. Cons: In starting from scratch, there is a lot of data entry required. Although customer service is a great help at uploading information, there is a lot of work on our end too. Steven we are so glad you are able to for track and assign PMs and work orders using MaintiMizer! Of course starting with a new software package does require some leg work but we are here to support you every step of the way! Comments: MaintiMizer is an overall good system. Allows for parts tracking, POR and Purchase Orders, Time tracking, and more. It does however rely heavily on user input and does not have a lot of automation needed in more robust, predictive environments. Cons: Customization and expanding capabilities is limited and expensive. Feels like an old system. Thanks for the review Amanda! MaintiMizer is constantly evolving; in fact, we have a quarterly update, which may have solved some of your issues. We¿d love to see what we can do to help resolve any other issues you may still have! Pros: It does the basics for dirt cheap, and I mean 5% of what you'd pay elsewhere. It offers mobile and purchase-order options within the program itself. Cons: Not based on API's, not scalable, clunky. Feels like you're back to WindowsVista or earlier era software. Any customization costs whereas most modern programs are highly customizable by the admin.